Now with a whopping twenty Gemini award nominations to its name, the fan-favorite Canadian series Murdoch Mysteries based on the Detective Murdoch collection of books by Maureen Jennings has finally shown itself to be deserving of such acclaim in this thoroughly entertaining second season released in a slim-packaged four-disc DVD set from Acorn Media. Exquisitely photographed to fit the Victorian-era Toronto setting, the rousing thirteen episodes of season two’s period piece often compared to a vintage C.S.I. finds the show not just hitting its stride but also excelling week in and week out at bringing audiences intellectually stimulating mysteries sure to make even avid fans of Sherlock Holmes and Hercule Poirot sit up and take notice. Although it was fun initially, the first season felt a little like we were watching a cool gimmick of a typical gritty modern day police procedural series that just so happened to be set over a hundred years ago. In this regard, Murdoch came complete with famous individuals of the era in a “historical cameo of the week” approach. And while I did expect more of the same with some of season two’s arrivals of Harry Houdini and Annie Oakley (just to name a couple), it seems evident that the ingenious writing staff realized how strong their own characters were. 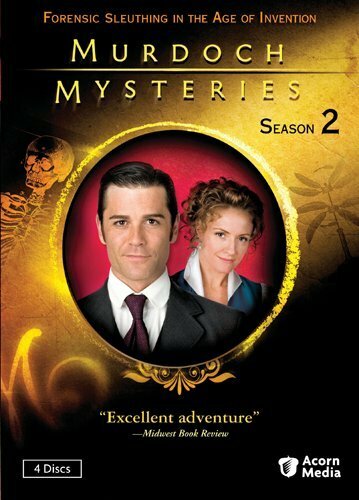 Shortly into the season, they put their trust in developing complicated storylines for Detective Murdoch (Yannick Bisson), forensic pathologist Dr. Julia Ogden (Helene Joy), the loudmouth Inspector Brackenried (Thomas Craig) and Murdoch’s loyal if slightly dim sidekick Constable George Crabtree (Johnny Harris). Whether it’s found in the arrival of long-lost relatives, a new love interest to throw another obstacle in Murdoch’s path of unrequited love for Dr. Ogden, unexpected side jobs, or accidental addiction, the interplay between the characters and the way the murders they solve tie in with their lives makes for a richer and far more sophisticated viewing experience than we witnessed in its first season run. Furthermore, Murdoch Mysteries -- like the UK’s 1960s period mystery series George Gently or even America’s Mad Men -- makes clever use out of its period setting to comment on issues still facing the world today from the dawn of war profiteering, meeting people blindly on the telegraph (read: internet), the complexities involving abortion, and the treatment of people of different faiths and ethnic backgrounds. And when you combine all of these factors of substantive plots with a crackerjack ensemble cast playing fully three dimensional characters whose lives we can still relate to more than a century later, you have the ingredients for something rare and highly recommended on TV that’s sure to grow into a larger cult hit on DVD.